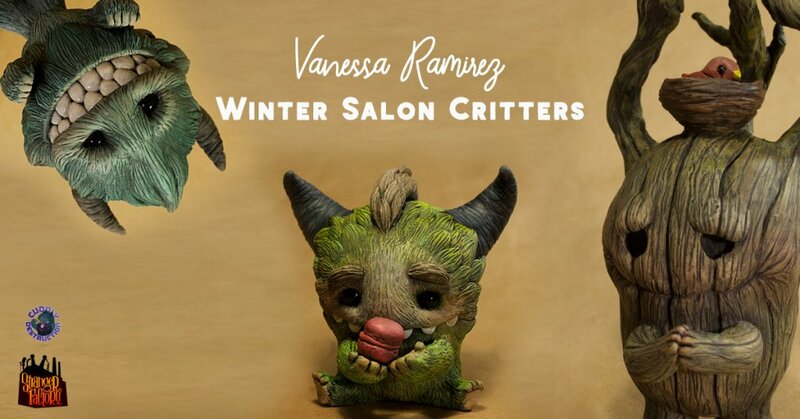 Stranger Factory’s annual “WinterSalon” is well under way and keeping our heart cosy on this cold winters day is Vanessa Ramirez Winter Salon Critters! Lovely to see Vanessa to be part of the WinterSalon and hopefully her 3 critter will find new homes this winter… Just remember, feed them at night as they might take a bit outta your toes. Like we keep saying, We love Vanessa monsters as they remind us a little like”Where The Wild Things Are” Obviously not the same. Falling in love with the texture and the expressions that Vanessa has put into these monsters. Being big fans of Vanessa’s art from drawings to sculptures like these, we’ve always been late to bring you the news before they have been snapped up so this will be your chance to own these little critters. Online sales will be launched at http://www.strangerfactory.com/ Monday 4th December. Find Vanessa via http://www.vanessaramirez.com/ Instagram and Twitter.